This website was initially set up in 2000 by Frank Nolan for local news and details of Parish Council meetings. In May 2013 the St Erth Parish Council launched its own dedicated website. Please use the menu above to view details of the Councillors, agenda, minutes etc or follow this link www.sterth-pc.gov.uk. Public meetings usually are held on the first Tuesday of each month at the Vestry Rooms, 25 Fore Street, St Erth, starting with public participation at 7.00 pm. The agenda is posted on the notice board outside the Star and at www.sterth-pc.gov.uk. 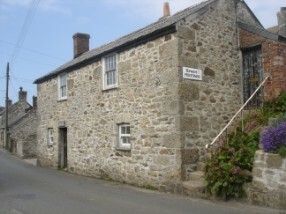 Any questions or comments for the Parish Council may be addressed to the parish clerk, Peter Rylett, at 25 Fore Street, 01736 757575, e-mail: clerk@sterth-pc.gov.uk. The agenda is posted on the notice board outside the StarInn. Any questions or comments for the Parish Council may be given to The Clerk in writing at the Vestry Rooms, by telephone: 01736 757575, or e-mail: clerk@sterth-pc.gov.uk. For those who are interested in the inception of the Council and its first 100 years then click on the image on the left.